More than 1,200 children at Eketsang Secondary School in South Africa take part in a Lindéngruppen sponsored project, run by Star for Life. The goal is to inspire personal achievement and curb the spread of HIV and AIDS. We believe that all young people should be given the chance to reach their full potential and that education is the key to a better future. From Beckers' factory near Johannesburg, South Africa, we have seen the devastating impact of HIV/AIDS at close range. Star for Life is a Swedish organisation, working to empower students with skills, knowledge and education to help them overcome social challenges. Star for Life coaches school administrators and teachers to build students' self-esteem and encourage them to pursue their dreams. Evaluations show that students in Star for Life programmes have better grades, better health and brighter views of the future. 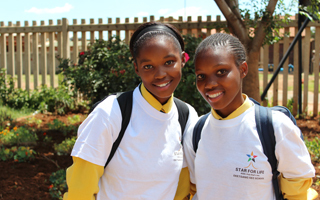 Also, the number of teenage pregnancies are significantly lower at schools connected to Star for Life. Lindéngruppen's sponsorship will enable the Star for Life programme at Eketsang Secondary School outside Johannesburg over three years.